The Portspoof program primary goal is to enhance your system's security through a set of new camouflage techniques. As a result of applying them your attackers' port scan result will become entirely mangled and to very significant extent meaningless. Result: As a result, it is impractical to use stealth (SYN, ACK, etc.) port scanning against your system, since all ports are always reported as OPEN. With this approach, it is really difficult to determine if a valid software is listening on a particular port (check out the screenshots). Scanning software usually tries to determine a service that is running on an open port. This step is mandatory if one would want to identify port numbers on which you are running your services on a system behind the Portspoof. For this reason, Portspoof will respond to every service probe with a valid service signature, that is dynamically generated based on a service signature regular expression database. Result: As a result, an attacker will not be able to determine which port numbers your system is truly using. Reverse exploitation with Portspoof: Portspoof can be used as an 'Exploitation Framework Frontend', that turns your system into a responsive and aggressive machine. In practice, this usually means exploiting your attackers' tools and exploits. At the moment there are few example exploits in the configuration file (portspoof.conf). 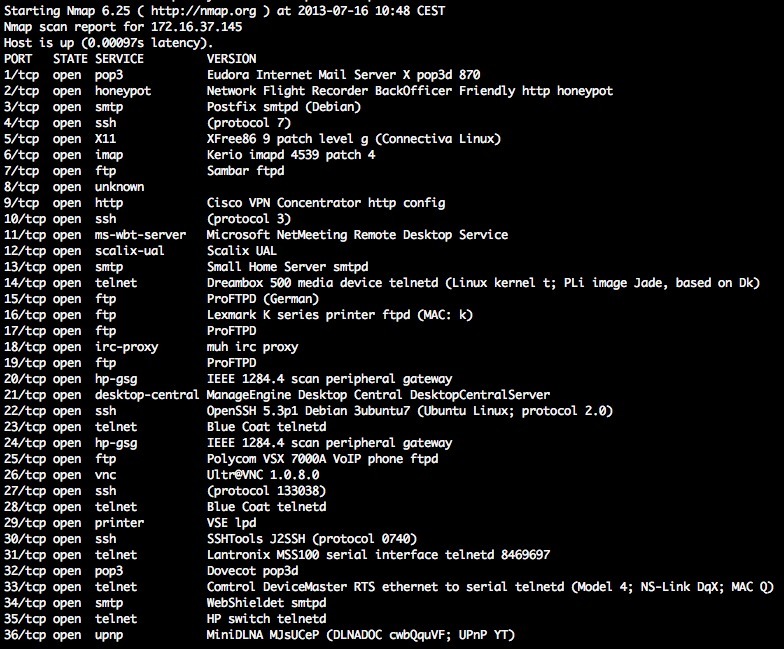 One of them exploits Nmap 6.25 default script. Portspoof is meant to be a lightweight, fast, portable and secure addition to any firewall system or security system. The general goal of the program is to make the reconossaince phase slow and bothersome for your attackers as much it is only possible. This is quite a change to the standard 5s Nmap scan, that will give a full view of your systems running services. your attackers will have a tough time while trying to identify all of your listening services. it takes more than 8 hours and 200MB of sent data in order to get all of the service banners for your system ( nmap -sV -p - equivalent). Portspoof is a userland software and does not require root privileges ! More than 9000 dynamic service signatures are supported ! Check out the documentation page for further details.